The arrangement for protecting a buried pipeline is illustrated in the figure. The buried pipe receives current from a DC power source via an auxiliary inert electrode buried in the ground. 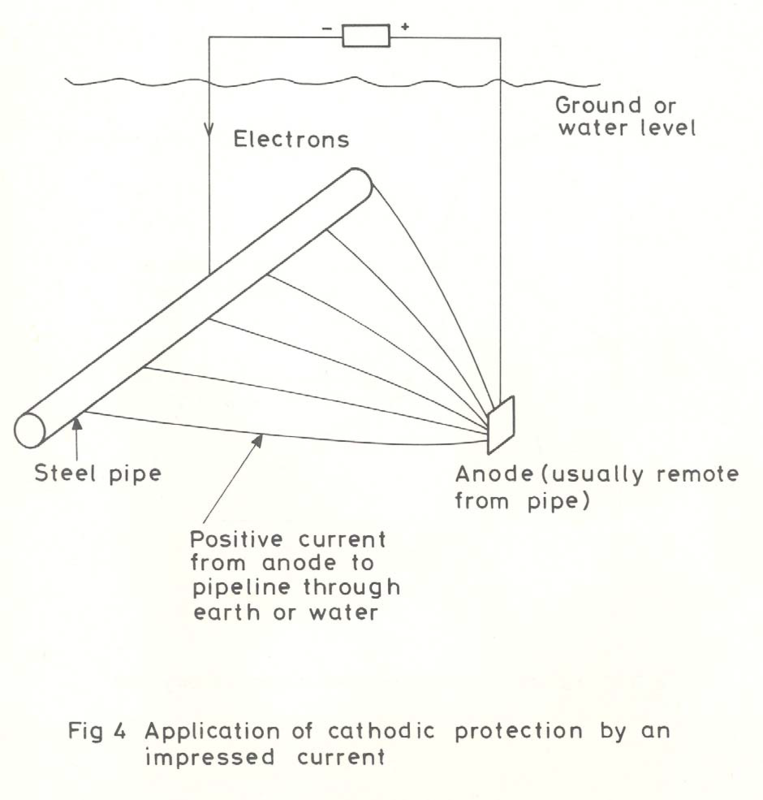 The pipe becomes the cathode and the auxiliary electrode the anode. The auxiliary electrode sometimes consists of scrap iron. In this case the iron will dissolve from the anode by reaction Fe > Fe2+ + 2e and the electrode is described as a consumable anode. If the anode is a noble metal or an electrochemically inert material, the surrounding environment will be oxidized and in water reaction 2H2O > O2 + 4H+ + 4e will occur. In saline solutions, however, chlorine may be produced at the anode. This may present problems in confined spaces. able to withstand high current densities at their surfaces without forming resistive barrier oxide layers, etc. The following materials have been used as anodes: magnetite, carbonaceous materials (graphite), high silicon iron (14-18% Si), lead/lead oxide, lead alloys, platinised materials (such as tantalum, niobium, titanium). Platinum, with its high resistance to corrosion, would be an ideal anode material but has the major disadvantage of very high cost. In practice, voltages up to 100 V and high current densities are possible on impressed-current anodes (see Table). Thus, large areas of a structure can be protected from a single anode and, because of the high driving voltage, the anode can be placed remote from the structure.